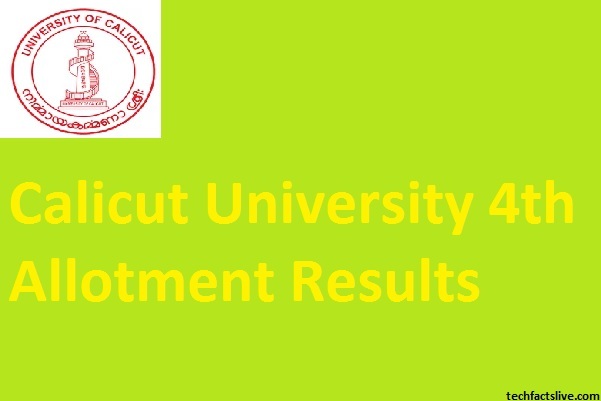 Calicut University fourth (4th) degree allotment result released today. Approximately 1 lakh students have registered their name for Calicut University trial allotment. Enrolled students can check their UG CAP fourth degree allotment result 2017 from the official website ugcap.uoc.ac.in. The last date for UG admissions in Calicut University is 17 August 2017. The allotment of seats into Calicut University is taken place through four allotments for all the categories. The candidates who are satisfied with their allotment in the first, second or third can take the admissions permanently to the college. The last/final or fourth allotment released and aspirants can check it from the official website cuonline.ac.in. The University of Calicut is an affiliating University for all the colleges in Kerala. It was established in the year 1968 and is ranked as 26th best University in India. The admission into Calicut University is done through an online procedure called Centralised Admission Process (CAP).The main aim of CAP is to have a transparent admission process and to shortlist all the skilled and merit students. The Calicut University CAP 4th degree allotment was released, and candidates can check it from the official web portal cuonline.ac.in. Contenders who would like to know their results should be ready with their CAP ID and +2 enrolment number. The candidates can also check their results from direct and activated link which is provided below. The classes for students who are joining in the fourth allotment will commence from 5 July. After the fourth allotment, all the students should take permanent admission to the prescribed college as this is the final allotment for colleges under Calicut University. Name of Organisation Calicut University. Open the official web portal cuonline.ac.in or uoc.ac.in. Then your allotment will be displayed.